Are you excited about becoming a Daughter of the Covenant? 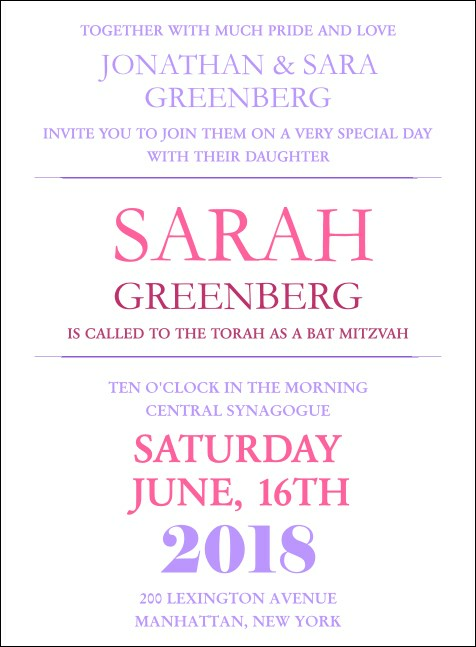 Whether you're the type to wear a pink kippah and tallis or you're just looking for an extra hint of softness as you convey your joy in a more conservative fashion, this Bat Mitzvah Pink and Lavender Invitation may be the perfect touch for your upcoming simcha. Fill in your event information on the easy template below! Complement your studies with TicketPrinting.com.